FRENCH ARTISTS IN EXILE 1870 - 1904"
“Impressionists in London: French Artists in Exile 1870-1904” until recently at the Tate Britain, brought together over 100 works by French artists who came to England because of the Franco-Prussian War. 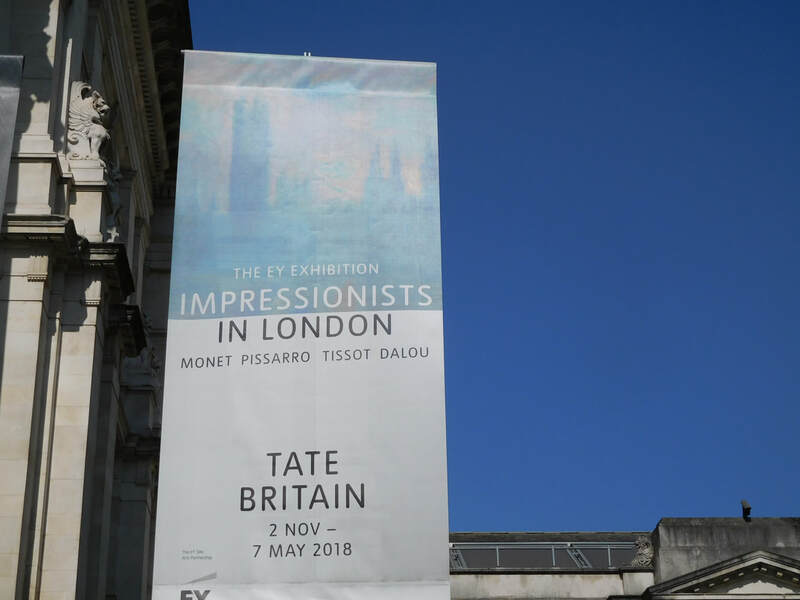 Contrary to the title, the exhibition was not limited to artists who participated in the Impressionist exhibitions in Paris or who were Impressionist in style but rather included works by a broad range of French artists who came to London during this period. It was interesting both in reminding us of why they came and in showing the impact of their time in London. In 1870, Prussia was promoting the unification of the various independent German states into one country. Concerned that German unification would upset the balance of power in Europe, the French government under Emperor Napoleon III declared war on Prussia. The declaration of war, however, brought together the German states. The French army was defeated and Napoleon III captured at the Battle of Sedan. Unwilling to admit defeat, a new Government of National Defense was declared and the French continued the war. The Germans then besieged Paris seeking to starve the French into submission. Meanwhile, the various new French armies that had been raised met with a string of disasters. With thousands dead and massive destruction, the new French government agreed to a humiliating armistice that required France to make territorial concessions. This did not end the violence but rather led to civil war. Finally, the French Army suppressed the Paris Commune and a wave of reprisals followed. Caught up in these events were the various artists living and working in France. Bazille joined the army was killed in battle. Degas and Manet joined the National Guard and endured the Siege of Paris. Pissaro and Sisley whose homes were destroyed, became refugees as did Monet who sought to avoid conscription. Human stories beneath the history books' headlines. For many French artists, London became a place of refuge. It was near to France but away from the fighting and it had a thriving art market. Their time in London affected the French artists' careers. For example, the art dealer Paul Durand-Ruel had come to London along with his family and stock and it was there that he heard about his fellow countrymen Monet and Pissaro. He would go on to handle and promote their work in his galleries. James Tissot had achieved some success in France before the war. He was not an Impressionist but he was friends with Manet, Degas and Morrisot. After fighting in the war, he came to London where he became quite successful doing genre paintings depicting upper class English society. The London experience had varying impacts on the Frenchmen's art. Pissaro, who lived outside of London, continued to do paintings similar to the paintings of the countryside that he did in France. Monet, who was struggling to establish himself, tried a variety of styles during his first stay in London. However, London clearly had a long term effect on Monet. After becoming a successful artist he returned several times to London. His Leicester Square at Night (1901) foreshadows abstract art, And then there is his series of paintings depicting the Thames and the Houses of Parliament in various fog conditions – some of his greatest masterpieces. These works inspired other artists. For example, after seeing Monet's paintings, Andre Derrain came to London and painted several of the same subjects as Monet but in his own style. Thus, we see the evolutionary impact on art of these artist's time in London. 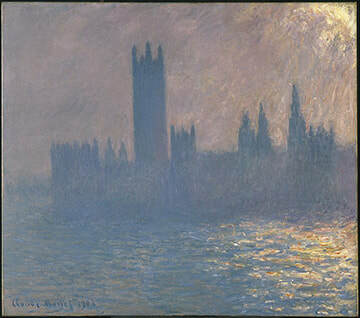 Above: One of Claude Monet's Houses of Parliament series.